What it is: Really good marshmallows. Worth it: Yes. Dense, sweet and creamy. If I see, say, a can of pumpkin seed oil, or a bag of fried parsnips, I’m pretty much going to grab it immediately. That sort of stuff is irresistible to me. On the other hand, some new type of milk chocolate caramel, or whatever, is simply a bore. Without even tasting that I can tell you exactly how good it is. It’s really, really good. You don’t need me to tell you that milk chocolate and caramel taste good. Maybe if you throw a little quinoa in there, I’d be interested. Maybe drop some pumpkin pie spice on it and I’ll perk up my ears. So why, you may be wondering, am I bothering to review something as mundane as average, unadorned, regular-old marshmallows? Well, one – because Trader Joe’s has never carried marshmallows before. You can get muhammara, chocolate-covered potato chips and 4 different types of guac, but you’re out of luck if you want dry beans. More importantly, however, these are the best damn marshmallows I’ve ever tasted – bar none. Never did I dream that the standard, industrial-produced marshmallows that I have literally consumed thousands of over the course of my life – in hot chocolate, on smores, as peeps, enrobed in cheap chocolate or dusted with coconut – could be anything more than little sugary pillow of air. Never did I dream that marshmallows, by themselves, could be a delicious, craveable treat. That’s what we’re talking about here with Trader Joe’s Maershmallows. It’s as if I’d only ever eaten garden variety Hershey bars my whole life, then someone gave me a dark chocolate bar filled with bacon-ganache. I never knew they could be this good. Trader Joe’s Marshmallows have literally opened my eyes to the world of inferior marshmallows I have been living in. Writing that down makes me feel like the most shallow person in the world – but I’ll take my enlightenment where I can get it, thank you. What makes these marshmallows stand out? Everything. Imagine for a moment, every enjoyable quality that an ordinary marshmallow has. Now improve them all by 200%. It’s like Trader Joe’s just brought a Lamborgini to a planet that only had go-karts. The very first thing you’ll notice as you pick up the bag is how dense and hefty these marshmallows are. Still squishy, yes. Still malleable and yielding, but one of these marshmallows sits in the hand with the weight of three ordinary name-brand marshmallows. It’s as if Trader Joe’s decided to pump a third less air into the same quantity of marshmallow stuff. Now take a bite. How much richier, chewier and – most notably – creamier do these Trader Joe’s Marshmallows taste? Even better, enjoy that satisfying sweetness. I’ve only never known the sugary, hit-you-in-the-bloodstream extruded corn syrup sweetness of name-brand marshmallows. Trader Joe’s marshmallows, even though they’re denser, are more mellow in their sweetness and more enjoyable to just snack on. Yes, I said it, snack on. These marshmallows are far more than the raw ingredient for some dish topping – they’re good enough to nibble at while sitting around watching a movie. 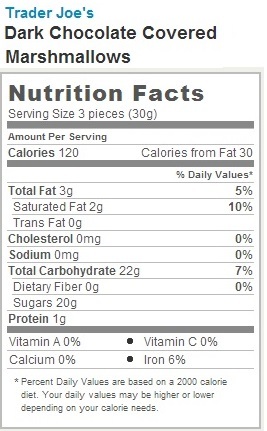 They’re more of a candy bar substitute than a marshmallow substitute. Of course, there’s nothing stopping you from using these in place of more ordinary marshmallows in any dish. I tried making a batch of rice krispy squares, and found that not only where they waaay harder to stir, they made for a gooier, and tastier final treat. No surprise there. There’s no doubt about it – Trader Joe’s Marshmallows deserve a rare 5-star review. They did for me what cookie butter did for me – opened my eyes to a whole new, delicious vista that I never knew existed. Would I Recommend It: Hell yeah! Would I Buy It Again: It’s the only type of marshmallow I’ll ever by again. Final Synopsis: The best marshmallows I’ve ever had in my whole life. 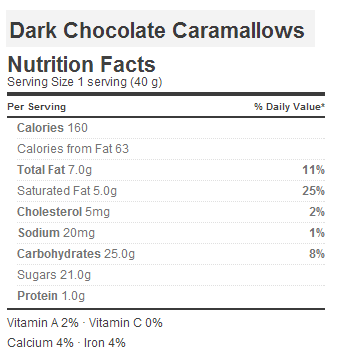 Brother, cousin, or just close friend of the family to the chocolate covered marshmallows that I reviewed on an ill-fated day previous, Trader Joe’s Dark Chocolate Caramallows are as delicious a confection of a word as they are a delicious confection. 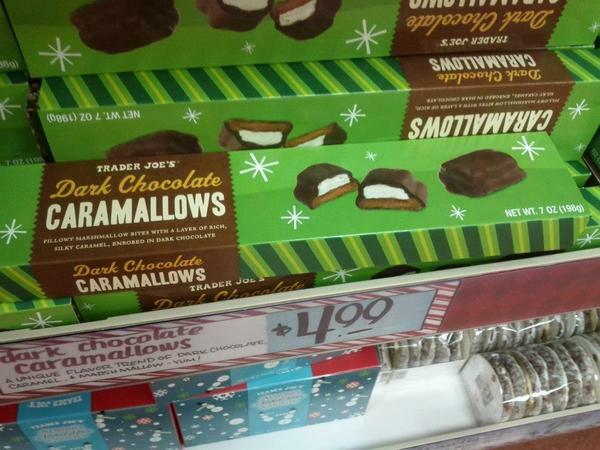 If you’re still with me after that bit of tortured grammar, than you must be wondering what Trader Joe’s Dark Chocolate Covered Marshmallows did wrong that Trader Joe’s Dark Chocolate Caramallows did right. 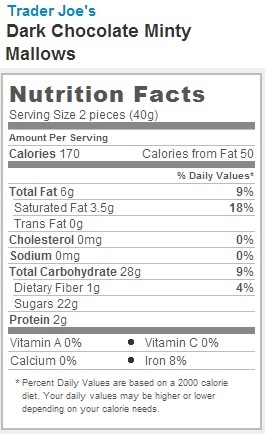 Well, for starters, they put caramel in it. A bunch of caramel. When you bite into one of these it’s pretty much half caramel half marshmallow. Mankind has wrought many a sweet treat but, with the possible exception of cookie butter, we have never made anything so tasty that a little caramel doesn’t improve it. Second, obviously, is the wonderful product name, so whimsical that it makes me chuckle with mirth whenever my twinkling eye lights upon it. And that’s all well and good, but as my most fervent, dedicated and imaginary readers have no doubt already noticed, neither of these two points refutes my argument against TJ’s regular old chocolate covered marshmallows – that they’re essentially just repackaged Easter candy. And, honestly, that criticism still stands, the only difference is that this is repackaged Easter Candy done right. The thing that I really enjoyed about these guys, beside the tooth nuking sweetness of the caramel and marshmallow cream, is the bitter kick of the dark chocolate shell. The cynic in me wants to chock up this sophisticated touch to the craze of putting dark chocolate on everything that you’re already putting milk chocolate on. Whether or not that’s the case, the bitter undertones of the dark chocolate act as a really wonderful counterpoint to the intensely sweet caramel and marshmallow. Of course, the other marshmallows had dark chocolate on them as well but the extra spongy texture of their marshmallow core made them practically bounce off your tongue. Where those were springy and chewy, the caramallows are ooey and gooey – they really just want to glue themselves to the top of your mouth and melt. That’s when the dark chocolate comes in, blunting the sugary edge of changing the character of the candy from empty calories to confection. And that, ultimately, is where my preference falls. As death tugs the hem of my bath robe inexorably closer to the grave, I’ve noticed that I can’t just wolf down the sweets like I used to. When I do make room for them on the budget, I like them to be something special. There are a million ways to spin sugar into carbo lumps, and most of them aren’t worth wasting the chocolate on. Trader Joe’s Dark Chocolate Caramallows might be just as cheap, but they’re actually meaningful to eat. Would I Recommend Them: If you aren’t diabetic yet, pick up a box before the season ends. Would I Buy Them Again: Yes, my girlish figure be damned. Final Synopsis: A dark chocolate covered marshmallow that’s worth picking up. Both types! Though the box on the left is obviously cooler. 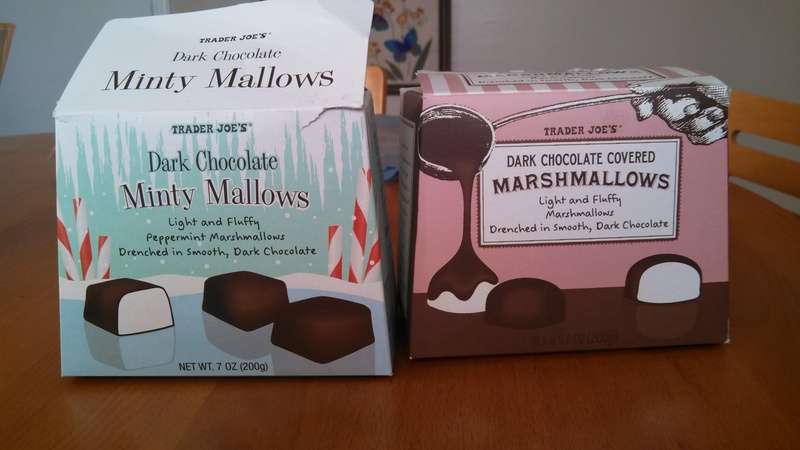 Brace yourselves readers, for a rare double post – reviewing both Trader Joe’s Dark Chocolate Marshmallows and Dark Chocolate Minty Marshmallows. And baby, how could I pass up these sweet little snacks – the holiday marshmallow display at Trader Joe’s this week looked so good that there was no way I couldn’t pick up both types. Unfortunately, that was as good as things got. Trader Joe’s Dark Chocolate Marshmallows are exactly what they sounds like – big blobs of marshmallow “enrobed” (as they like to say) in a dark chocolate shell. The sizes between these two types vary dramatically for some reason. The regular marshmallows are hemispheres about the size of a half dollar, while the mint flavored ones are rectangular and about 50% larger. Both sound pretty much exactly like what you think you’re going to get, and that was something of a let down. It was the newness and novelty of these items that drew me to them – chocolate covered marshmallows weren’t something I’d ever seen in a grocery store before, let alone Christmas themed ones. I was absolutely ready to get blitzed by some brand new, delicious holiday treat. I mean, for all I knew these could be the next toffee popcorn or peppermint bark. When you first bite into one of these, however, you quickly discover that there’s no secret holiday magic here. The chocolate shell is brittle and thin, and sticks to the under laying marshmallow as you chew it. Over all, the taste was strangely familiar for something I’d never had before. The chocolate, despite being “dark”, is still quite sweet and, to be honest, slightly cheap tasting. The same can be said of the marshmallow filling – sweet and a little cheap tasting. Then, suddenly, I remembered why it was all so familiar – I have had these before, for Halloween and Easter. Chocolate covered marshmallows snacks might be a new thing for Christmas, but they’re hardly new to the holiday scene. I’ve you’ve ever had a Cadbury marshmallow egg, you know pretty much what Trader Joe’s Dark Chocolate Covered Marshmallows taste like. You also know what’s it’s like to eat one – which is to say, a mouthful. These are marshmallows that are going to keep you chewing for a minute or two as you masticate the mallow core and melt down the many little chocolate shards. While I wanted to like these, I found myself facing the fairly tricky question of what to do with them. Eating them straight out of the box is a less than satisfying experience. They taste good, in the same way a Cadbury Marshmallow Egg tastes good, but it’s also not a taste you’re going to be hankering for bite after bite. The big idea printed on the side of each box, and I grant that it’s a good one, is to add these guys to hot chocolate. In theory this is brilliant – marshmallows in hot chocolate are great, so dark chocolate covered marshmallows must be even better, right? Unfortunately, that’s not really what I found. The marshmallow, once dissolved in the hot chocolate, is just as good as any other marshmallow I’ve had. The problem is that the chocolate coating slows down the whole marshmallow melting process. I placed one regular dark chocolate marshmallow in a nice hot cup of hot chocolate, and by the time it was half dissolved the hot chocolate had cooled to tepid. There’s a good reason someone invented those tiny little marshmallow to go in your hot chocolate – waiting for a big marshmallow to dissolve is tedious, covering a big marshmallow with a protective shell only slows things down further. Of the two, I think the minty mallows were the ones I preferred, simply because they performed an actual function. The mint in these is strong and fresh, and they perform admirably as after dinner mints. On the other hand, unlike after dinner mints they’re a big mouthful to chew on, which isn’t exactly what you’re looking for after you’ve just stuffed yourself on potatoes au grautin. Outside of that function, and despite their holiday whimsy, neither of these marshmallows really gave me a reason to care about them. Would I Recommend Them: There’s just not much to recommend here. Would I Buy Them Again: I think I’ll just buy those little marshmallows instead next time. Final Synopsis: Christmas should leave the chocolate covered marshmallows to Easter.